I am writing about an event that I advertised earlier here, Johannes Fabian’s address to the Department of Sociology and Anthropology at Concordia University in Montreal, co-organized with the Department of Anthropology at McGill University. The event lasted from 5:00 to 7:00pm and was heavily attended, with at least 60 people present, from at least three separate anthropology departments in Montreal (including those from the Université de Montréal). In addition, three of us are anthropology bloggers, all tied to the Department at Concordia: Owen Wiltshire (Another Anthro Blog), Alexandre Enkerli (Disparate), and myself. We all took notes, and Owen also recorded the event on a digital audio recorder. Afterwards, thinking I had a great idea, I encouraged Owen (not that he needed to be encouraged) to post his own essay on the event, and then navigated over to Alexandre to do the same…except that, as the event closed, Alexandre declared that his post was already done. I found out why his head was down for the whole event whenever I looked at him: he was Tweeting his notes straight to his blog from his iPhone, a device that I saw for the first time as he held it, a tiny thing that looks like it would make typing impossible. And yet, he was all done (see his Twitter blog here). Owen’s post is now online as well. Johannes Fabian’s talk seemed to be extremely relevant to very much that has been discussed here and across anthropology blogs, and so I will devote some time to laying out his presentation. The talk ranged from open access and open source, to virtuality, to ethnographic writing, to the politics and ethics of ethnography, and even to the Human Terrain System. 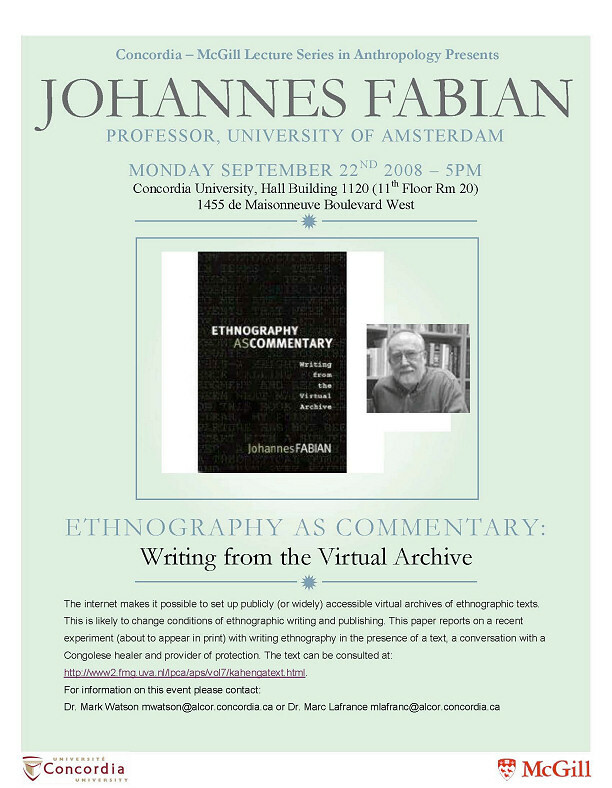 For those who would like to have a very good idea of what Fabian said, it essentially mirrored the first twenty pages, the Introduction, of what he hinted may be his very last book: Ethnography as Commentary: Writing from the Virtual Archive. Fabian is a professor emeritus at the Department of Cultural Anthropology at the University of Amsterdam, and so, officially retired. Fabian began by correcting his introduction to the audience, noting that he is now retired, that he was fired from Northwestern University, and that he considers himself an American anthropologist since he did his studies in the U.S., worked in the U.S., and continues to spend considerable time there. He began by trying to sum up what “we” do as ethnographers. He outlined his research in the Katanga, Congo, from 1972 to 1974, although he first went in 1967 to do his PhD dissertation research. His PhD dissertation was titled, “Language and Labour among Swahili-speaking Mineworkers in Katanga,” and was funded by the National Endowment for the Humanities. In his time in Congo, he worked in a zinc refining plant, as well as a plant making “neo-African furniture.” In time he became acquainted with actors and painters, after working with a charismatic Catholic movement. Working in the university obviates a sustained ethnographic focus, Fabian stated. The best kind of research is a great research project, and no grant. He did not elaborate, and he may not have been joking. The project at the centre of his talk, and new/last book, concerning his recording of a conversation with a “magician/healer” over 30 years ago. Having been burglarized, Fabian decided to contract the services of a “sorcerer” to protect his house. The ceremony that involved warding off evil spirits and thus safeguarding it from malicious intrusions is called “closing the house.” The conversation that followed the “closing” ceremony remained as an audio tape for over three decades, until it was finally transcribed, digitized, and deposited in this virtual archive. This text, and Fabian’s reflection on the process of producing and commenting on it, is what led to the book shown above. The Internet may invigorate our commitment to ethnography, Fabian exclaimed. The Internet will make ethnographies accessible. Ethnographic documents can be deposited in a virtual archive. “Virtual,” he noted, can connote “not real.” However, Fabian argued, virtual, like virtue, is derived from virtus, and should instead connote effectiveness and strength. Indeed, he continued, in terms of their practicality, documents in a virtual archive are “more real,” more real in how they mediate between events and experience and their analysis. His book did not evolve from some theoretical master plan. Instead, Fabian told us, he began by simply transcribing and then digitizing, and this led to theoretical reflection afterwards. How did Fabian cross thee borders? However, he said — and this is one of his key points — without self-consciousness, without duplicity, there could have been no document that emerged from this experience. There would have been no record of his crossing. It is through epistemological duplicity that document is produced. The researcher must be duplicitous to be a researcher, Fabian argued, he must put on an act, as a researcher then friend then observer, etc. It is this duplicity that makes ethnography possible. Now Fabian cautioned that he did not intend to appeal to moralists with moral critiques of duplicity, but I did not think that made epistemological duplicity any cleaner. When he took notes after the “closing,” he crossed the border between patient and ethnographer. Fabian said we must disrupt the convention of knowing what to do before starting ethnographic research, and that we should probably stop forcing graduate students to figure out what they will do and what they will think, and how, before they even commence “fieldwork.” Fabian calls this work he is doing as “closing house on late ethnography,” as a take on the “closing house” ceremony but also as a way of suggesting that he is closing shop, reaching for closure with this, his last book. Fabian also argued that it is not possible to keep the researcher out of the acts that require his presence. As a result, we should not keep ourselves out of own ethnographic writing. Fabian asked whether it was too late to be writing ethnography. Especially since — and here he started to sound again like the Fabian that I thought Fabian was — ethnography has roots in an imperial gaze that defined the science of mankind conceived as natural history. We are today looking at the end of the ethnographic monograph, he concluded, even while ethnography is in full inflation with a host of other disciplines, with market researchers, and so forth. Any new debates, he argued, would have to be about genre, about how to present knowledge, the form of its representation. Texts acquire a “new presence” in the virtual archive. Here Fabian entered his discussion about commentary as a genre of writing, and not commentary as a brief gloss (for example, the way I did in my last post). He is speaking of commentary as an ethnography that requires the copresence of a substantial text. Commentary, Fabian continued, involves a practice of writing in a community of writers and readers (he may have “discovered” blogging here, except he told one questioner after the event that he does not read any of the anthropology blogs — well, that may be good news for me in the end). Producing texts in a virtual archive, and the writing of commentary, frees ethnographic writing from the constraints of print, such as minimizing the original language to a few select quotes (and this is where I spotted his printed text circulating the room, in contrast to the “other text” as I call it, the one on his website linked to above). Such commentary, as ethnographic writing, is no longer predicated on the absence of its object. It is not consumed by the devices of presentation. All of the details are available now, one is no longer forced to cater to the “spare me the details” crowd, he commented. Fabian proceeded to reflect on the peculiar status of a text that makes it an “ethnographic” text. An ethnographic text, he thinks, is not literature. It is not fiction (I seriously beg to differ). It is not found. It does not come from nor contribute to a canon (I have no idea how he could say this), and it is not to be found in the archives (except that the Human Resource Area Files did archive pieces of ethnographic texts). I think that if we had detained Fabian on this line of thinking, we would have discovered that the emperor has no clothes. The presence of the text signals the absence of the event it documents. (It was not clear why Fabian felt the need to state the obvious here.) The text is present, the event is past. We are free to do what we want with text, Fabian declared. He also noted that each time we must rethink theory and method as we undertake to produce a new text. Fabian’s text-centredness, he told us, seemed to be a logical consequence of his linguistic approach. Texts lie between communication between actors and the representation of their communication. Fabian’s next point, not well connected to this last one, or any other one for that matter, was that the materiality of archives grows, changes, and consists of multiple parts. Once again, and now I am ready to protest, I do not see any point in making such simple points as if we had all missed the obvious. At this stage in the presentation, a rapid turnaround occurred. This is when I expected to hear the radical Fabian, the Fabian critical of anthropology. Instead, I saw a conservative and defensive Fabian, at first hiding behind an exterior that suggested otherwise, only to bare all to the contrary. Fabian began by saying that we must be conscious of the political and economic interests wielded by our countries in the countries in which we study. But then he stated we should have no code of ethics, just like there is no code of ethics for mathematics, in what I thought was an absolutely awful analogy that I thought we had heard for the last time sometime around 1880. Fabian then made a comment in passing, raising his eyebrows, about “all the ethics discussions at the AAA meetings each year” as if these bothered him. Anthropology is an intellectual endeavour, Fabian asserted, not a profession (and once again I wonder how one could make such an obviously false assertion). Fabian argued that human subjects review and “cultural property” will make ethnography impossible. Indeed, he may have a point, but it may be a point worth defending, not attacking. We cannot derive our legitimacy from a code of ethics, Fabian exclaimed, and when I say exclaimed I mean he was firm, not loud, not agitated. In fact the whole event, with everyone included, was very light, friendly, and calm. With archived texts, Fabian continued, one is free to quote, copy and comment. What about anonymity for informants? Fabian complained that we often fail to distinguish between damaging and critical statements, and there was no way he could not be critical in the face of an informant, or an interlocutor as he sometimes preferred to call them. We cannot be neutral in communication. Ethnographers and interlocutors are both agents, so why is just one being named? Should interlocutors be listed as coauthors? Yes, to acknowledge them…but no, not to be burdened with the responsibility of authorship. Did Fabian consult Kahenga, his interlocutor in the recorded conversation that he archived online? No. He could not reach him. Appropriation, in Fabian’s commentary, is often understood in terms of ethics and politics, but in his view it is more about epistemology and history. Does the ethnographer “appropriate” knowledge? Well, he said, if by “appropriate” you stick to the meaning of the word, which means to make one’s own, then yes, and what is so bad about making that knowledge one’s own? How can it be appropriated anyway? Knowledge is not property, he argued. Property is equivocal. Property consists of things. Only objects can be property. As for expropriation, Fabian has an even worse bone of contention. Expropriation means to take something away, so how does the ethnographer in gaining knowledge “take it away” from his interlocutors? Fabian then entered a short discussion about compensating one’s interlocutors. He asserted, quite firmly: “I will not and have never provided remuneration for conversation.” Clearly, he would turn green with my document here. I will not use the names of the questioners because for all I know they may have any number of reasons for not having their presence documented in an online source, for this date and time. This can be an intellectual endeavour, and still respect the welfare of one’s fellows, a lesson that Fabian seems to dismiss. The lines in bold print are the questions, each time followed by Johannes Fabian’s answers. Institutional Review Boards often ask us WHEN we will destroy all our documents, and how we plan to do so. You archived a document from 30 years ago, and now perpetuate its existence. How would you handle the requirements from a review board? Just fill in what they want, and then give a damn. No really, I said it here: Fill it in and forget it. You showed the virtues of the text in the virtual archive, openly accessible, and then you proceeded to publish a different text in print. Why? What distinguishes the two texts? They are different media. The book is what brought everything together. Producing the virtual archive text led to the book. And the original text, and all of the footnotes you see online, came together as the book. In fact, I could not have brought it all together if I were not writing a book. And then someone next to me, out of the blue, asked an incredible question. I asked the one about open access above, and the one asked by a PhD student next to me seemed to arise as if someone had read my thoughts, and I was amazed, and very disappointed by the answer. What do you think about how anthropologists are being used by the military and intelligence, what do you think about the Human Terrain System and its use of anthropologists? NO COMMENT. No really, I have no comment. Others, like [David] Price have spoken about these things. Many have had much to say. I mean, we all know, what made anthropology possible. Anthropology could not be if it had not gathered information for the state. You know, statistics, the word comes from “statistas,” agents of the state. So all these knowledge forms come from serving power. They could not be without it. Anthropology was always used. So I say: NO COMMENT. What is most amazing about your post isn’t the timestamp but how elaborate, detailed, clear, and precise it is. I’m impressed. And grateful. Apart from a few differences in terms of selection (for instance, on the question about the audience for ethnographic monographs), I probably would have written a similar summary… if I had been given a complete transcript of the talk! I mean: you’re good! Ok, more on content, for a second. My perception (reinforced by post-talk interactions) is that Fabian was partly playful and partly “radical” in his approach during the talk. The answer on HTS you seem to react so strongly about may actually be the tip of the iceberg in terms of what seems to be Fabian’s understanding of the relationships between anthropology and, let’s say, data-gathering processes which are typically not seen too positively by the majority of professional ethnographers. A public version of my summary of my impression of Fabian’s response would be: the HTS controversy is getting people riled up the days but those same people seem to forget that nastier things keep happening all over the discipline. Not only is it not anything new but it’s clearly not limited to the U.S., to warzones, or to some demonized members of the profession. Sure, I’m interpreting, here. Based on very little direct information (though some was given post-talk). But it’s as close as I’m willing to get to the HTS buzz. About disconnected ideas and other issues of structure/form… What the talk made me think of was more of a rondo form, with verse and chorus. This kind of structure makes it easier to approach hypertext-style non-linearity than a straightforward series of points, laid out one after the other. And the language/communication dimensions made quite a bit of sense in the current context. As for other points, your post is helping me keep track of the content, regardless of opinions I might have had about them. I actually paid relatively little attention to the details of his “first chapter as laid out in front of us.” I do remember some things that you don’t mention here, but I may not have “taken in” a tenth of what you did take in. And speaking of what the three of us (ConU anthrobloggers) each did during this talk… You raise excellent points and I think we should keep the ball rolling (probably outside of comments on this post). Obviously, I’m looking forward to Owen’s version. Regardless of our degrees of agreement with Fabian, the guy produced lots of useful quotes about Open Access, Intellectual Property, collaborative ethnography, dialogue, inter-subjectivity, field methods, and literary genres in a relatively short amount of time. So I kind of expect Owen will have nice research material (especially if he takes Fabian as a representative of a segment of the broader anthro culture). My tweets were in continuity with something I did all weekend long at the PodCamp Montreal UnConference. Part of it was simply a thoughtstream on presentation style (it just so happens that I think it was Fabian’s forte, during this session). Part of it was a way to bring attention to the Fabian talk, outside of McG/ConU/UdeM. Part of it was based on observing the crowd (contrary to popular belief, my head wasn’t down the whole time and I also listen to audience reactions). Part of it was about the drama of it all (been teaching a bit of Goffman, lately). And part of it was just playful. I did post a few tweets which were really meant as mere summaries of Fabian’s points. But my intention wasn’t to summarize Fabian’s talk. Owen was recording it anyway. I knew I’d have other occasions to hear Fabian, this week. And there were enough people in the room to collectively archive all the pieces of his talk (if this talk ended up being significant/relevant enough). Maybe a strange strategy on my part. But it’s actually related to what I tell students to do during our class meetings (since I record my lectures and post notes). Anyhoo, thanks again for all your help (including the trackback) and congratulations on an impressive note-taking practise! Thanks very much Alex for all the comments, and the ones about the coverage especially. However, don’t let that stop you from filling in any blanks. Owen did record his comments, but will not be making the recording available online. Writing the notes actually helps to cement the memories in my head — now I need neither the notes nor the recording. I am pretty disappointed with the talk overall, I have to say that, even if I don’t want to write a post (which would be as long or longer) simply criticizing his talk. By the way, I am not convinced that we have nastier things happening in the social-cultural side of anthropology right now beyond the participation in counterinsurgency programs. I am open to any examples of nastier stuff though. HTS is limited to the U.S. and to war zones for now, so I am not sure if I understood you on that point. The person who raised the HTS question made an excellent point to me afterward. She had worked as a journalist for several years before entering anthropology. She noted that in the U.S. journalists got a law passed prohibiting the CIA from using journalists for undercover missions, because that would endanger the lives of ALL journalists overseas who would all potentially be suspected of serving the CIA. Now, anthropology is being used, and I don’t mean just by HTS, but by PRISP and NSEP. This is an atrociously serious point, and until more of us get killed, I am afraid that many just won’t get it, and even then they will find ways to make excuses to ignore reality. In the meantime, they will help to find ways for people in U.S. occupied territories to get killed by U.S. forces. As I said in another post, the compromise of some will compromise us all. I have nothing against demonizing demons, incidentally, if you were alluding to McFate. Of course, one could also ask the question of what makes her a “member of the discipline.” As far as I know, she has never worked as an anthropologist. An engineer who works as a security guard — we have quite a few of those in Canada — is called what? A security guard. What McFate has done is to prey on anthropology and to use one of her degrees (she is also a lawyer, and worked as a corporate spy…those labels are also available) to sell the idea of culture to the military and to squeeze herself into a lucrative position in a hierarchy in the process. Now we are all seen as useful by the wrong people, and we have been exposed as legitimate targets of violence. Anyway, that’s my take, and from what I see on most anthropology blogs, I am part of a tiny minority that has aired such critical views of HTS, etc. Thank you for providing a commentary/memoranda of this event. I haven’t followed or engaged in any of the HTS debates at all (that is my disclaimer)- yet, my initial reactions to certain comments remain simplistically the same and perhaps fall somewhere in line with Fabian’s…anthropology has always been used as an extension and agent of the state- so why are we so shocked? Is that not the way anthropology came to be? My enduring question hovers around the ethical/moral intervention of anthropologists in wars in general. If ‘they’ (we?) were working for what one considered to be the ‘right/just side’ of things would one be equally opposed? PS Do you ‘bloggers’ ever sleep?! Therefore, does denouncing others’ political actions result in depriving oneself of similar actions? Well no one is “shocked.” Those who are critics are angry, disappointed, dismayed. Saying that is the way anthropology came to be then suggests we should also go back to measuring people’s skulls and comparing Africans to monkeys and putting them in freak shows at world fairs. Is that what YOU signed up for when you enrolled in anthropology? No, probably not, and supposedly we learned, and we were changing and criticizing ourselves. This militarization undoes all of that. Sorry, I can’t be indifferent, and since you’re choosing to get a degree in this field and will end up with the same label, “anthropologist,” I don’t think you can afford to be unmoved by all this. Nobody should be making any more arguments for neutrality, so my answer to that question is: no. Political positions only seem to be equivalent if one is not paying attention, or assuming that ‘all politics is just politics which is just bad,’ is an argument for apathy that allows others then to make decisions for you. I realize that it is a popular, mainline position in North America — specifically, North America — to take the “all politics is bad” position, but that is a result of the infantilization of popular discourse, the inculcation of immaturity and irresponsibility. A political position that holds that a minority are superior to all others and that all others must be subjugated to the will of a minority…can be countered by a political position that calls for social justice, equality, and mutual respect. I don’t see how the second position, in denouncing the first, thereby denounces itself. U.S. journalists play a huge part in the war, so I don’t see for a second how they escaped this trouble even if they have a law. Iraq would never have happened if it weren’t for inept, biased, and pro-war journalists. It would be the same for anthropologists if there were more of them. Did I mention the way American journalists screamed when Al Jazeera showed dead Americans, and said nothing when Fox showed dead Afghans? I don’t think the HTS program helps the military, and it definitely hurts anthropology. That should be reason enough to undo it. Much much much more dangerous imho is the funding initiatives the army is setting up to turn academics into a powerful propaganda machine. This I think is much more dangerous than HTS workers who can’t even speak local dialects trying to gather sensitive information. But then it sort of makes me ill to be worrying about the reputation of anthropology, when the big question is how do we stop being oil-loving-idiots-at-war? Thanks very much Owen. Incidentally, you might have seen: I have been having my own tussles with WordPress and almost migrated this whole thing to a private server last night. Have anthropologists stopped measuring skulls? I am not calling for one to be ‘indifferent’ (aka liberal) or taking the stance that ‘all politics is bad’ or calling for neutrality. In fact, I thought I was doing the exact opposite. If the position were ever to present itself and I had the opportunity to work ‘as an anthropologist’ in a war zone on the side that is fighting for “social justice, equality and mutual respect” I would do so. That was the point that I was trying to make. What I am trying to say is, no, I do not support anthropologists who are working for the HTS, nor do I support the imperialist intervention in Iraq or Afghanistan (therefore, I am neither unmoved by this discussion or indifferent) but I am not opposed to anthropologists working in war zones. When I signed up for anthropology I had no illusions that it has been decolonized nor that it will be. But sure, let’s be dismayed, angry and disappointed when we are confronted by what we already know. Please do not read too much irony or sarcasm in these words, of course it is a ‘worthy’ endeavor for people (and anthropologists) who are against the HTS (and the wars…) to denounce such programs while attempting to unshackle anthropology from it’s colonialist chains… what could be more important? Also, I would never self-identify as an anthropologist- does that count for something? Yes, Nirmala it counts for something — something like 50%, because the other half of the situation consists of others ascribing that identity to you. It is official, they don’t sleep. hmmm, if only it were so black and white. I would like to think that some of those people consisting of the 50% don’t even know what an anthropologist is. Nirmala, you asked, and what I gave you was a review of identity politics, which consist of auto-denomination on the one hand (50%) and ascription on the other (50%). It’s not black and white, but those do happen to be the two prevailing processes surrounding the determination of public identities, and you should know this. Incidentally, it does not matter at all if those making the ascriptions “know what an anthropologist is” (you might not know either, that’s one reason why it is not black and white), what matters is that they make the ascription. Rereading your previous comments, I realize that I do not understand what you are saying, because when I answered what seemed to be a direct question, you inverted what you had said previously. I think what I need to do is wait for you to figure out what you really want to say, and mean to say, and then maybe I can respond. Perhaps you should identify the anthropologists who measure skulls Nirmala, and name the courses you took at Concordia where you were asked to measure skulls. Otherwise the facile commentary should be shelved. The point a number of us are making is that if no one will dare to criticize these developments, then matters certainly will not ever change.